This distinguished series has been conceptualized with an aim to nurture the highly creative minds of young learners. The artworks and activities included in these books have been taken from the children’s immediate surroundings. 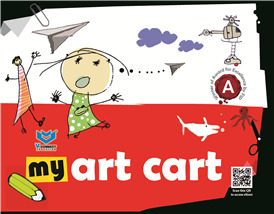 The friendly approach enables them to learn concepts and ideas of art and craft step-by-step. Activities like Play Time, Fun Time, Best Out of Waste add value to the series. For activities, complete material packed in reusable plastic and paper boxes has been provided along with all the books. An audio-video CD, showing the complete demonstration of all art and craft work has been provided with the book.